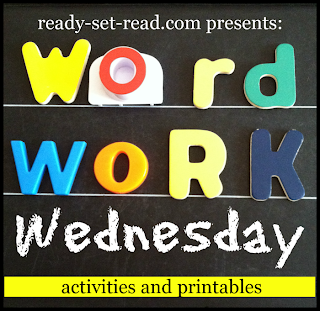 Each week on Ready-Set-Read I share a word work activity in the middle of the week. I call this series, "Word Work Wednesday." Clever, eh? So far I have looked at What is Word Work? and What are Word Families? 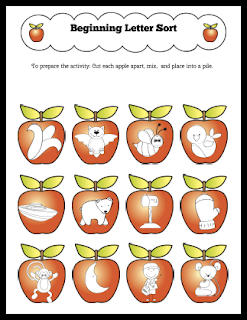 I've shared printables and activities to accompany working with word families. It's important to note, word work time in an early literacy classroom often doesn't actually involve any words. Emergent learners often work with picture sorts. Children can sort concepts they learn after reading a particular book or studying a particular theme. For example, during a zoo unit, kids may sort animals by zoo animals or farm animals. Children may also use picture sorts to examine beginning letter sounds, blends, rhyming words, and more. Word work can also be tied to the thematic learning that is occuring in a classroom. Today we are going to talk about the individual parts that make up words, letters, and how students can study letter sounds to improve their understanding of words. 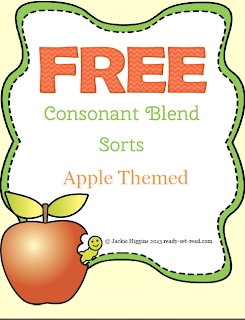 I'm going to share how I've created beginning letter and beginning blend sorts for a thematic apple unit. For emergent readers, beginning letter sorts will be with picture cards. The teacher will pick 2-4 letters and provide picture cards to model the beginning letter sound. Using a familiar text or a theme that students are studying can be helpful as well. 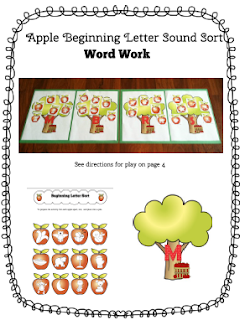 I have created a beginning letter sound sort that is a part of my apple unit in my Teachers Pay Teachers Store. I'm using this as an example of how to teach beginning letter sounds. Direct the children on how to sort words bringing attention to the beginning sound. For example, say, "m-m-moon" and elongate the "mmm" as you place the word, drawing attention to the beginning sound. Use pictures that are clear and will match the child's vocabulary. If a picture is confusing to a child or they consistently call it the wrong word during a sort, take it out of the pile. The apple set has six clear pictures for each of the four consonants above. Model the sort, have the child try it independently, and have the child check the sort. Begin by comparing blends to single consonant sounds. Then move to contrasting groups of blends. Finally, let children match the beginning blend picture to the written beginning blend. These sorts can be done in the same way as sorting consonant blends. Chose the blends to teach by looking at the child's reading and writing. I've created a free printable for children to review beginning consonant blends. They can "pick" the picture card and put in the correctly labeled blend basket. This is also a good informal assessment to see if children have any knowledge of beginning blends. You can download this Word Work Activity for Beginning Consonant Blends in my Teachers Pay Teachers Store for FREE! Children are usually ready to control consonant blends at the same time they are ready for word families. For more information about word families, including a free printable, check out What are Word Families?